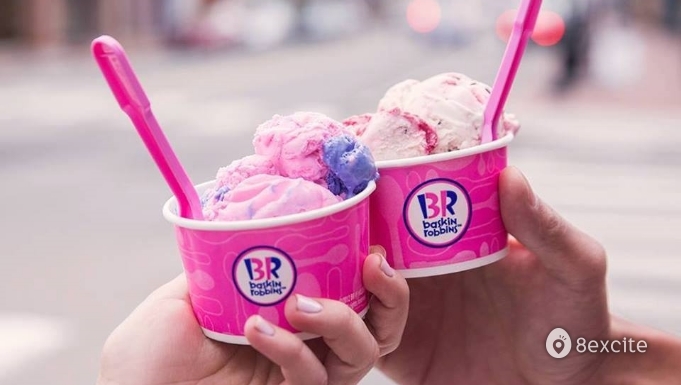 Baskin-Robbins offers over 1,000 flavors of ice cream, including Sugar Free, Fat Free and Light. Their menu also includes frozen yogurt, sorbets, sherbets, beverages, cakes, sundaes and handpacked for every occasion. Holder is entitled to (1) Single Regular Scoop Ice Cream or Two Scoop Junior Sundae Ice Cream of any flavor. This voucher is not refundable, exchangeable for cash or with vouchers of other denominations. This voucher is not valid with any other promotions or discounts. Golden Scoop Sdn Bhd accepts no responsibility for the loss, theft or destruction of the voucher and has no obligation to replace or refund value for lost, stolen or damaged. Golden Scoop reserves the right to reject any voucher if deemed forged, defaced or expired. Golden Scoop Sdn Bhd reserves the right to revise the terms & conditions without prior notice.